The best part about it is/are the comments....you have to scroll through and be encouraged by ALL the cat-caring crazies out there who are crumpling up paper, tossing acorns and dangling toys on strings for their cats. Thank you, Mrs. Homegrown! I chatted with Mary Emily today in Pet Supermarket, and found out her cat's favorite toy. She told me, 'We cut a piece of weedeater string about six feet long." While the kitty watches, they shake and wiggle the end of the string. Wish I had a video of the family demonstrating how kitty 'shakes & shimmies' when the thick plastic string is wiggled just so! An old-fashioned tick-tick-tick kitchen timer is fun for the bug hunters among our cats. Get it ticking and put it under a pillow on the couch when your cat isn't looking. It's neater, safer and less expensive than the 'nickel a cricket' treat bags I used to bring home! Happy Meals--for kids AND cats! From Jennifer in Texas: "My cat loves the stuffed animals that come in Happy Meals. I get a smaller, 'healthier' meal and she gets a great toss-and-catch toy. Just make sure to remove any stickers or tags!" If your cat likes to burrow and hide, or just make a general mess! Find a friend or office that still uses the old-fashioned 'single-strip' shredder, or get one on Freecycle.com. 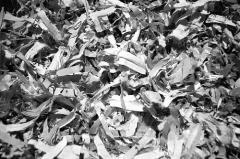 (They are harder and harder to find as the multi-cut shredders are considered more effective for privacy protection.) Take a big bag of shreds and put it into a large box, Rubbermaid bin or small wading pool. This will pack down as the cat(s) play in it, but can be fluffed up for a few days of fun and then recycled. How frugal and 'green' is that? *Safety note: Make sure there are no staples in the shreds. If there are, you will find some small metal pieces in the bottom of the bag after it's emptied. Discard that bag of shreds and try again! Next time you go out for lunch, bring home a paper-wrapped drinking straw for your cat. Put it on the floor and roll it a little to show how the paper crinkles. For some cats, this is the invitation to attack and bite at the wrapper, and unwrap the straw. 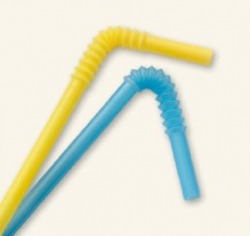 Winky and Blinky, the 'orange tabby twins' would then hold the straw in their two paws and chew it completely flat. *Safety note: This is an idea to try with supervision the first time, until you know how your cat will react. A really vigorous 'chew-fest' could result in small pieces of plastic straw that you don't want your kitty to eat! Many cat households have used the common brown paper grocery bag as a toy, I'm sure. 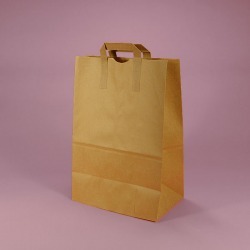 I am old enough that I remember the bags without handles. The cats enjoyed to run in a bag placed on the floor and hide from the other cats, reaching out to 'tag' them as they ran by. If you roll the bags down once or twice at the top, I found, they will stay open longer. Eventually, they do get smashed flat and become little nests for cats to rest in. When that loses its fun-factor, the bag can be shaken back open to use as a recycled paper container. I didn't realize that the bags with handles could be a hazard to cats until the first time a cat got her head stuck in a handle. What a commotion and a calamity! Oh, the running and flapping and crashing about that followed. Eventually the kitty---I think it was Tiny, the senior cat in the household now--ran under the bed, ripping the bag so that only the handle and a small part of the bag were left attached to her neck. She stayed under the bed for a long, long time! I never made the mistake again of putting out a paper bag without removing the handles first! I usually threw the handles in the recycle bin after cutting or tearing them off the bags. Now Misty Dawn, a fellow 'friend of ferals' writes, "Our cats love the paper handles off shopping bags. I just cut them off and you can spray a little catnip on there too. " It makes sense that the interesting texture and shape of the handles would have some play value for cats.....thanks, Misty, for sharing this! Visiting with my neighbor Gail recently, the subject of frugal toys for cats came into the conversation. I wonder how that happened? She had bundled up some small stuffed animals that kitty 'Ducky' didn't enjoy, and asked me to pass them on to the rescue cats. Then, in answer to my question about alternative toys she reached down and picked up a grapestem from the floor. 'This is Ducky's favorite toy ever,' she said. "He knocks it around, picks it up, runs with it and drops it to knock around again." I am going to have to buy some grapes! As soon as I can get over to Steve's vet's office, I'll try to get a photo of the finished product!